It may seem like a very tiny thing, but labels go far beyond towards the safety of your product. If you are business offers, these labels are an inevitable part of your job. It is very vital o use the right kind of labels while transporting your goods to customers. Without these labels, you can risk your product to breaking. 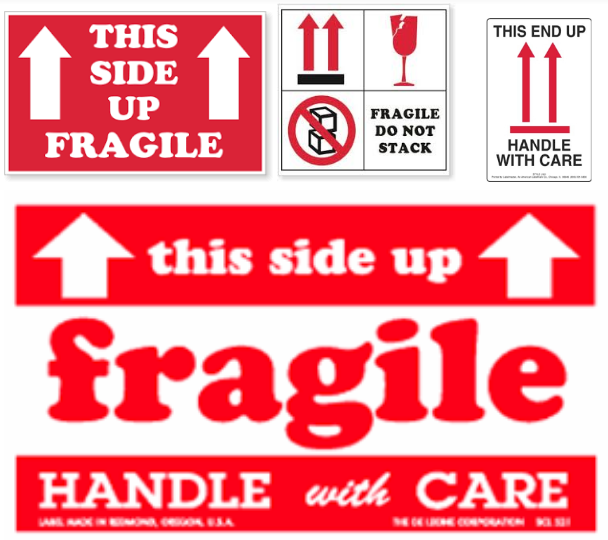 In order to get fragile or delicate items delivered safely, these items need to be labelled. These labels act as a signal to persons who comes within the range of your shipment. These labels help you identify packages and communicate handling instructions with international pictographs and bright coloring. We at Valuemailers go an extra mile to give you a perfect packaging solution with proper labels and arrows because we know how important it is to you and your brand. Arrow Labels: These are bright colored labels that indicate the side of the package that should face upwards. These labels are basically used on electronics, appliances or industrial products. Fragile Labels: These labels are necessary for delicate and fragile products which can break easily. These Labels ensures protection to fragile items. These labels are mainly used for electronics and anything that is made of glass. These labels are made from striking and bright colors, to enhance the or visibility. ValueMailers is worlds famous for their arrow and fragile labels because of their high glue properties and also for their quality of the labels they provide with in effective prices. Communicate handling instructions with international pictographs and bright coloring. They help you keep in compliance with Military Standard 129P, 49 CFR, ICAO, 49 CFR and ASTM standards. These labels protect your items against all the hazards during shipping. They are usually made from bright colors so that they are noticeable. This entry was posted in Uncategorized and tagged arrow labels, fragile labels, best price arrow labels, high quality arrow labels, best price fragile labels, high quality fragile labels, best price arrow labels in usa, best price fragile labels in USA on January 7, 2019 by valuemailers seo.